If you had any doubts that Apple and Verizon were working together, this should quiet them. 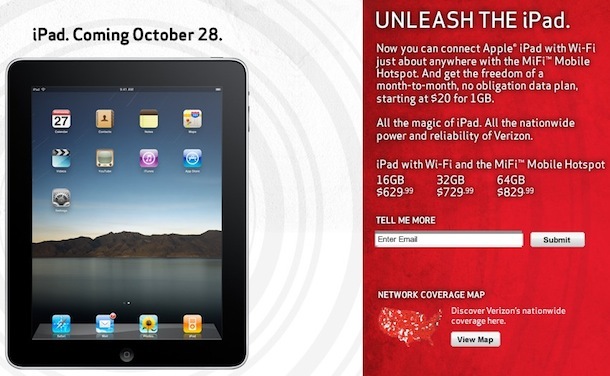 Verizon will begin offering the iPad in their stores starting on October 28. The iPad model offered will be the WiFi model, but each iPad will be bundled with a Verizon MiFi mobile hotspot to insure wireless data coverage. The MiFi hotspot plans will start at $20 a month for 1GB of data usage, there will be no contract required so you can effectively get the same month-to-month data use that you currently get with the iPad 3G data plans through AT&T. This looks like another sign that the Verizon iPhone release date is approaching quickly, and perhaps the next iPad will be CDMA compatible as well, eliminating the need for the MiFi hotspot. Verizon iPhone release date: early 2011? Ugh, so you have to carry around an additional hot spot to use the service? That’s ridiculous. I’m glad I went with the AT&T supported 3G unit, I have enough stuff to carry around. This “story” indicates absolutely nothing. Particularly, it indicates nothing about Verizon and an iPhone. Target and Walmart sell the iPad as well, you don’t see a special iPhone just for them. People having wet dreams over Verizon need to get a life. The service is horrible, and while the coverage is better than anyone elses, it comes at a pretty high cost. Personally I’ve not found a single dead spot in the city of Phoenix with AT&T. Your comments about Target and Walmart are true, but I do think this indicates that Apple will have a phone on the Verizon network in the near future. I can’t speak for Phoenix but AT&T service in San Francisco and the Bay Area is dreadful, Verizon will give people the option for finding better service. More importantly though, a Verizon iPhone & iPad increases the market exposure and will bring in many millions of new customers. I think that is the real motivator behind the alliance, not finding better cellular coverage. There is certainly some unrealistic expectation for a Verizon iPhone solving everyones coverage problems, I think their network will suffer just as much under the load as AT&T’s did at launch. The retail price of these things is $270, or $99 with a 2 year contract – with the iPad you get one for $130 contract free! Because MiFi works with ANY WiFi device. That means your MacBook Pro, your iPad, your iPhone, your Moms netbook, your cousins Android tablet, ANY WiFi device now has cellular access through a tiny access point that is can go anywhere. This is BETTER than a built-in 3G modem, because any of your devices can use it unrestricted! Get one while you can, when a CDMA iPad comes out this deal will cease and you’ll have to buy several data plans for several devices instead of just one for all.